COURSES NOW AVAIVABLE TO BUY IN THE ONLINE SHOP ! These courses will be run from our new purpose built workshops in a former textile mill on the outskirts of Holmfirth. 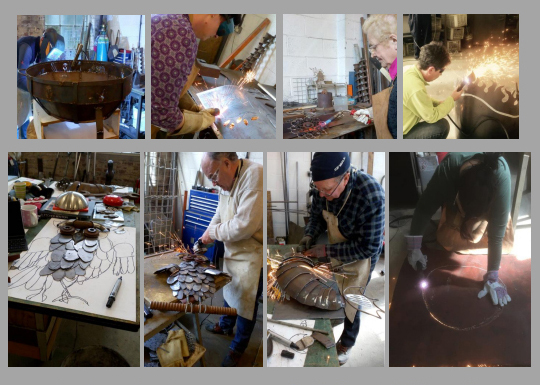 Course tutors David Mayne and Mick Kirkby Geddes are award winning sculptors each with 30 years experience of working with metal in a variety of different ways. SPACES ARE LIMITED FOR THESE COURSES SO IT IS ADVISABLE TO REGISTER YOUR INTEREST AS SOON AS POSSIBLE. HERE IS WHAT ONE OF OUR PREVIOUS STUDENTS THOUGHT. David and Mick have vast experience of producing steel sculpture and this course will give an insight into how they create their unique work in this versatile material. Safe use of tools and equipment.